In my previous post, our discussion focused on acceptance of the reality occurring right in front of your eyes. Today’s post is the next step in growing that acceptance into gratitude. I asked a few people about this over the last week, and for the most part, is was acknowledged that this is a bigger challenge. Some said that is was nearly impossible to look at an unfavorable situation and say that apparently it happened exactly as it was supposed to happen. I had the same challenge when I had Parkinson’s. As you know, the Parkinson’s Recipe for Recovery® is a soul, mind, and body recovery program. This “okay, apparently” attitude required quieting my mind and opening up my heart to accepting life as it was right in front of my eyes. Instead, I used my logical mind against itself. I asked myself, what could possibly be a good reason why this was happening. After some thought, I remembered that the previous evening, Sally had prepared us a wonderful dinner of blacks beans and rice. Obviously, this level of acceptance carries with it a bit of surrender. Essentially, it is surrendering that not only is reality being accepted and acknowledged, but also, that the reality in front of your eyes is happening just as it is supposed to be happening. I found in my recovery that this level of acceptance of what was happening helped me search for the silver lining in every cloud. It shut off fear, worry, anger, and frustration. It shifted my energy from over-thinking the negative aspects of things to relaxing into a feeling that everything was happening just as it was supposed to happen, including my recovery. I still use this “Okay. 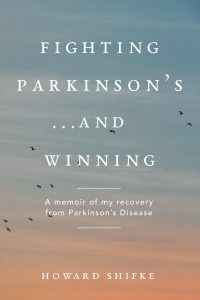 Apparently, this happened exactly as it was supposed to happen.” It is a life lesson, not just a Parkinson’s recovery lesson. So, you have Parkinson’s…okay! What are you going to do about it, right here, right now? Why not say, “okay,” get on your path to recovery with the Recipe, tell yourself, “Okay, apparently my recovery is happening just as it is supposed to be happening,” and stay on your path to recovery until you fully recover. So by taking the time to come up with positive interpretations for whatever negative events turn up, we can truly take charge of our lives and flood our minds and souls with the positive thoughts and emotions that heal our bodies and keep them healthy. I love it! A most excellent stratagem for life. Thanks a lot, Howard. This is definitely an area I have struggled with, missing my previous healthy fully functioning busy life. I do realize and am very grateful I am able to spend more quality time with my teenagers because of this illness. For this I am eternally grateful, the joy of impromptu long chats in the afternoon after school or being able to attend their sports events are priceless. I know in the blink of an eye they will be off leading their own lives. Wow, what a wonderful, wise insight!